Most of us have put off a task to do later at some point in our life, but a serial procrastinator can often have more serious perfectionist character traits i.e. they put something off for fear of failure, for fear of being judged or shamed. The risk of feeling that pain is minimised or avoided by not carrying out the task, opting for always the easier route; avoiding altogether. Trust me, I know as a serial lifetime perfectionist and procrastinator. As a Clinical Hypnotherapist I have seen many cases of this and have worked through my own hurdles with self-hypnosis over the years. These character traits are stopping you from achieving your goals. Here are some of the most common things people say to me who come through my door – they don’t feel like they have the right skills yet to go out and market their products or set up their business or go for that amazing job, or do that thing whatever it is, they feel they need to do more or are “quite there yet”. They adopt a put themselves down attitude, or not quite good enough attitude. They convince themselves it needs more work and to do it later. In other words, they need to be “perfect” before they go out there and do whatever it is they need to do, often not getting to where they want to. This is damaging to self esteem and confidence. This trait I also see in students who have exams and serially procrastinate during revision time. They have a fear of failure of the ultimate pending exam. Often they tend to cram like crazy when the actual exam date is almost unbearably close, the sense of urgency kicks in. This can lead to a lot of stress and anxiety in turn and the individual can often end up not being able to achieve the grades they would like to and are capable of. Why do people do this? Fear of Failing, being shamed as mentioned above. More than that, a perfectionist has an ideal image in their mind as to what they must be, have or achieve. Anything short of this is deemed unacceptable to someone with these traits. This can lead to hurting one’s own sense of self-worth. 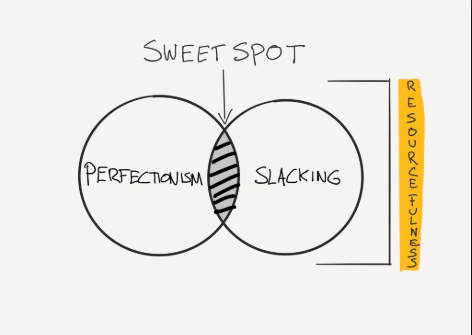 The reality is that perfectionism does not exist, it is a myth drawn up in our minds. By accepting and opening up about this, we can have a greater connection with others . Focus on improving yourself rather than worrying on an external opinion/judgement. This takes away from wanting to be “the best” and moves you toward getting better yourself which is more rewarding and reinforces self-esteem. Take action and DO. Set goals in stages that feel more realistic without lowering the standards, so that they feel more achievable. Then acknowledge the progress you make at each stage. Keep the bigger picture in mind. I find personally if the start of the day gets off to a good start and I tackle a tough obstacle, the rest of the day goes more smoothly. Done is better than perfect – adopt the 80% rule – if you manage to get almost all of that list complete or manage to do 80% of the task, that’s fine, do it swiftly then move on to the next, don’t fixate on getting the last 10-20% “perfect” and waste time. Be kind to yourself, the way you are kind to your friends and others. Just think, if your friend made a mistake you would not be harsh on them, so why are you so harsh on yourself. Adopt the same outlook. Remember there is no such thing as perfectionism so stop trying to achieve it. Also remember that you will not please everybody and that is also OK. Be kind to everybody, but most importantly to yourself. Laugh at yourself, its ok! I am a Clinical Hypnotherapist based at No.10 Harley Street in Central London. I am a specialist in Anxiety & Stress related issues. I also treat Low Self-Esteem & Confidence, Insomnia, Emotional Eating, Smoking addiction, Phobias. Is Your Procrastination Getting Seriously Out Of Hand?